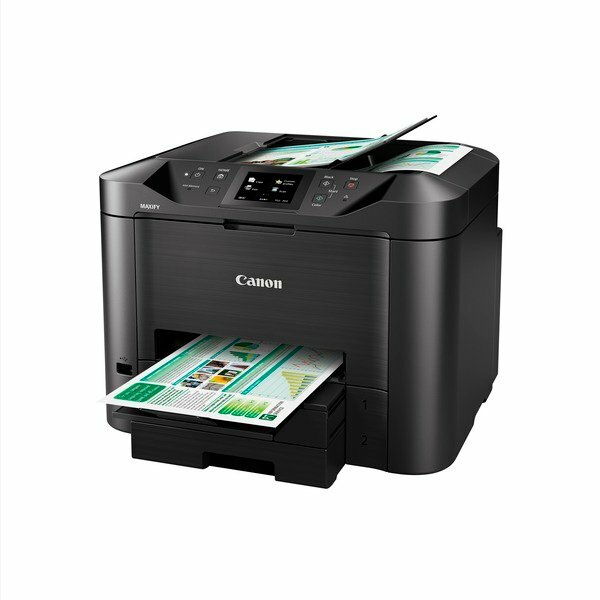 The Canon MAXIFY MB-5450 is perfect for small office printing, without compromising on performance, quality or reliability. With internet and Wi-Fi connections, and single-pass, two-sided scanning, you can produce results at high volumes, faster than ever before. Dual Resistant High Density ink has been especially developed for business printing. This high-quality ink gives you clear and fresh colours, deep blacks and crisp text, without the worry of smudging. A large 8.8cm colour touchscreen provides easy access to all of the Canon MAXIFY MB5450’s functions. In addition to a 500-sheet feeder, 50-sheet document feeder and double-sided printing, the it also has a variety of paper sizes and types available, from A4 plain paper to labels, envelopes, photo paper and ID document copying, taking the hassle out of the usual office print jobs. With exceptionally low running costs, the Canon MAXIFY MB-5450 can produce superior results that don’t cost the Earth. This is due to its very low power usage and low ink usage, with its cartridges yielding 2,500 mono pages and 1,500 colour pages. Simple Network Management Protocol allows you to connect to the printer in your workplace, making it easy to use in a busy office environment. The Canon MAXIFY MB5450 does this by giving you the ability to check the printer’s entire printing history, ink levels, error status and page counts. You can also filter IP addresses to restrict printing access and provide secure scan-to-email. As the Canon MAXIFY MB5450 has been replaced by newer models, it can be difficult to find replacement parts should it require repairs or maintenance.